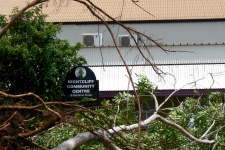 Cyclone damage in Darwin caused by Cyclone Helen was limited, especially compared to the havoc wrought by Tracey in 1974. Cyclone Helen crossed the coast about 20 ks south of Darwin and was about a level 2 category storm with a small radius of only 40 kilometres or so. Still a lot of large trees came down causing widespread blackouts when they fell over power lines. Some local areas were without power for 12 hours, a few for a couple of days, while a lot of Darwin hardly noticed there had been a storm. A few suburban roads were blocked, however there are plenty of routes through suburbia, so this hardly caused any real problems. A small number of buildings were damaged, and there were a lot of close calls as large African Mahogony trees lost out because of their shallow root systems. 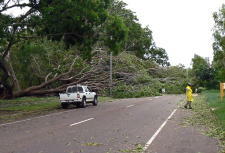 Much of the damage in severe cyclones is caused by objects which are picked up by the wind and smashed into buildings. Meanwhile a long term project to put all of Darwin's powerlines underground continues, hopefully preventing power outages next time a few trees are knocked over. This work has been partially completed with Nightcliff, Rapid Creek and Milner now with underground power. However these projects always seem to come in over budget and many of the older northern suburbs still have above ground power systems. Darwin was one of the first places to have a complete underground NBN internet system installed which hopefully will cope with future cyclones. Read the story of Cyclone Tracy here. Return from Cyclone Damage Darwin 2008 to Enjoy Darwin Home.